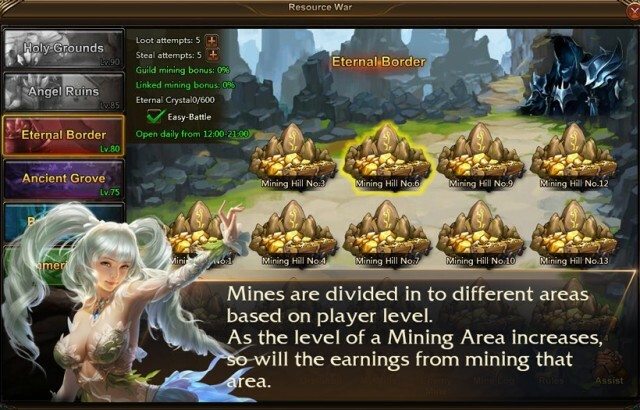 Multi-level Mining Areas: Mines are divided in to different areas based on player level to create a more even battlefield for all players. As the level of a Mining Area increases, so will the earnings from mining that area (see image 2). Types of Mines: Each Mining Area has 14 Mine Hills and mine yields are consistent for all Mine Hills in the same area (see image 3). 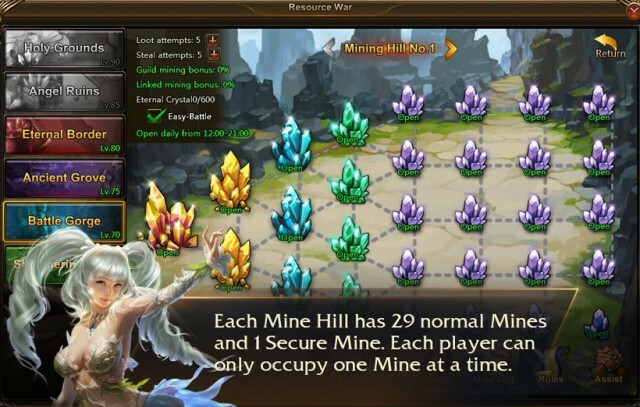 Each Mine Hill has 29 normal Mines and 1 Secure Mine. Each player can only occupy one Mine at a time. Normal Mines contain limited ore and will close down once all the ore has been extracted; Secure Mines contain an infinite amount of ore, but have much lower yield. Normal Mines that have not been occupied by players are guarded by monsters. Players must defeat these monsters to occupy the mines. After a mine has been occupied, other players can steal or capture it by attacking and defeating the occupier. Mines are divided into 5 grades with the highest grade always located on the far left. Mines of higher grades will yield better earnings. If a player wants to take a higher grade mines, they first have to abandon their current mine and lose part of its current earnings (see image 4). Secure mines are not guarded by monsters and can be mined by multiple players at the same time. 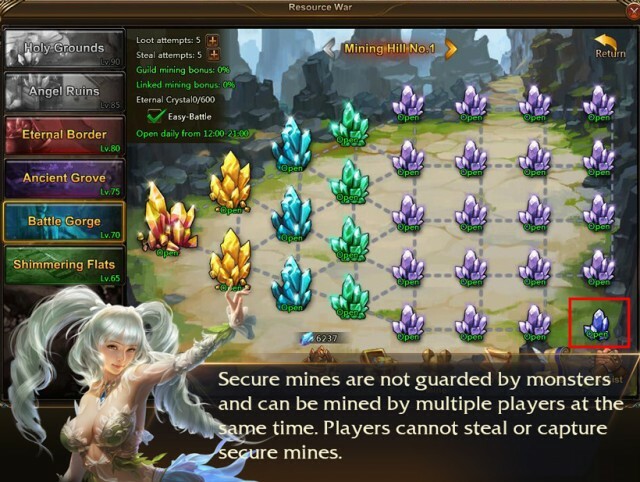 Players cannot steal or capture secure mines (see image 5). Various Interactive Modes: Players can attack other players to steal or capture their mines. Successfully capturing a mine will change ownership of that mine to the attacker, and deduct a portion of earnings from the previous occupier. Successfully stealing a mine will take a portion the occupier’s current earnings but not change ownership of the mine. 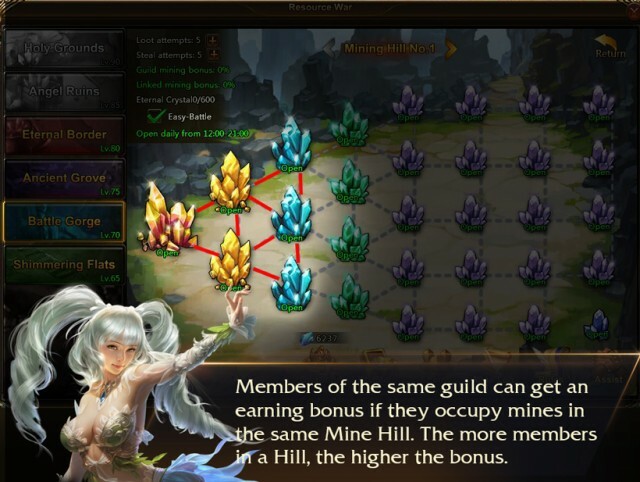 Guild Bonuses: Members of the same guild can get an earning bonus if they occupy mines in the same Mine Hill. The more members in a Hill, the higher the bonus. Therefore, guild members should try to occupy the same Mine Hill together to maximum earnings. Members of a guild will also get a Linked Bonus if they occupy mines that are adjacent to each other (see image 6). 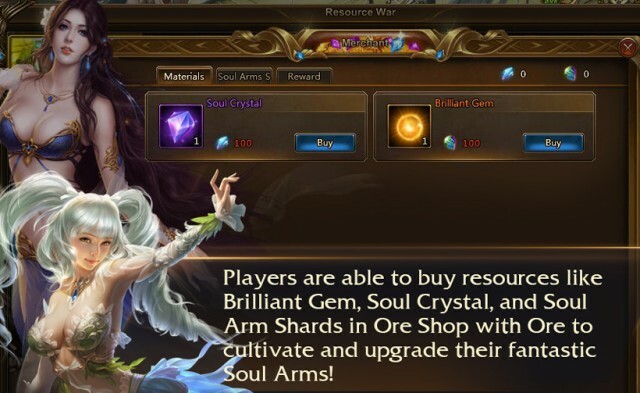 Redeem Soul Arms Resources: Players are able to buy resources like Brilliant Gem, Soul Crystal, and Soul Arm Shards in Ore Shop with Ore to cultivate and upgrade their fantastic Soul Arms!